The capital of Sicily, Palermo was founded by the Phoenicians under the name of Ziz. Kick off your visit on the 8th (Tue): contemplate the long history of San Giuseppe dei Teatini, explore the historical opulence of Castello di Caccamo, then pause for some serene contemplation at Chiesa del Gesu, then contemplate in the serene atmosphere at Duomo di Monreale, and finally take in the architecture and atmosphere at Cattedrale di Palermo. Here are some ideas for day two: steep yourself in history at Oratorio di Santa Cita, then take in the spiritual surroundings of Santuario Santa Rosalia, then kick back and relax at Spiaggia di Mondello, and finally make a trip to Norman Palace and Palatine Chapel. For maps, ratings, other places to visit, and tourist information, refer to the Palermo trip itinerary planner . Brisbane, Australia to Palermo is an approximately 28-hour combination of flight and bus. You can also fly. The time zone changes from Australian Eastern Standard Time (Queensland) to Central European Time, which is usually a -9 hour difference. Finish your sightseeing early on the 10th (Thu) to allow enough time to drive to Catania. The landscape surrounding Catania, a medieval city on Sicily's eastern coast, is dominated by Mount Etna, the tallest active volcano in Europe. On the 10th (Thu), take in the awesome beauty at Mount Etna. On the 11th (Fri), you'll have a packed day of sightseeing: take in the architecture and atmosphere at Duomo di Taormina, then head off the coast to Isola Bella, then take a stroll around Piazza del Duomo di Acireale, and finally take in the architecture and atmosphere at Diocesi Di Acireale. To find other places to visit, photos, more things to do, and more tourist information, go to the Catania road trip planning tool . You can drive from Palermo to Catania in 2.5 hours. Other options are to take a bus; or take a train. Wrap up your sightseeing on the 11th (Fri) early enough to travel to Reggio Calabria. Reggio di Calabria, commonly known as Reggio Calabria or simply Reggio in Southern Italy, is the largest city and the most populated comune of Calabria, Southern Italy. Kick off your visit on the 12th (Sat): get to know the fascinating history of Lungomare Falcomata, get to know the fascinating history of Chianalea di Scilla, take a memorable drive along Belvedere di Piazza San Rocco, then pause for some serene contemplation at Parrocchia Maria S.S Immacolata di Scilla e Favazzina, then step into the grandiose world of Castello Ruffo di Scilla, and finally admire the masterpieces at Museo Archeologico Nazionale di Reggio Calabria. Here are some ideas for day two: see the interesting displays at Pinacoteca Civica Di Reggio Calabria, contemplate in the serene atmosphere at Chiesa degli Ottimati, and then take in the spiritual surroundings of Basilica Cattedrale di Reggio Calabria Maria SS Asunta. For maps, other places to visit, traveler tips, and tourist information, use the Reggio Calabria trip maker tool . You can do a combination of taxi and ferry from Catania to Reggio Calabria in 1.5 hours. Alternatively, you can do a combination of bus and ferry; or do a combination of train and ferry. Expect a daytime high around 32°C in September, and nighttime lows around 24°C. Wrap up your sightseeing on the 13th (Sun) to allow time to drive to Taranto. Taranto is a coastal city in Apulia, Southern Italy. On the 14th (Mon), step off the mainland to explore Cheradi Islands, explore the historical opulence of Castello Aragonese, and then look for all kinds of wild species at Jonian Dolphin Conservation. Keep things going the next day: get outside with Spiaggia di Lido Silvana, then take in the architecture and atmosphere at San Domenico Maggiore Church, and then get engrossed in the history at Museo Nazionale Archeologico. To see reviews, ratings, more things to do, and other tourist information, refer to the Taranto driving holiday planner . You can drive from Reggio Calabria to Taranto in 4.5 hours. Alternatively, you can take a bus; or take a train. September in Taranto sees daily highs of 32°C and lows of 22°C at night. Cap off your sightseeing on the 15th (Tue) early enough to go by car to Salve. Salve is a 5,000 inhabitants village and comune in the province of Lecce, in the Apulia region of south-east Italy.HistoryIndications of Bronze Age settlements in the territory of Salve have been revealed by several archaeological findings. Start off your visit on the 16th (Wed): appreciate the extensive heritage of Centro Storico di Presicce, then admire the striking features of Palazzo Protonobilissimo Risolo, then get to know the fascinating history of Centro Storico Medievale di Specchia, and finally get a new perspective on things with Boat Tours & Water Sports. Get ready for a full day of sightseeing on the 17th (Thu): stop by Delizie in Contea, then tour the pleasant surroundings at Lido 77, and then make a trip to Antichi Frantoi Ipogei. To see maps, more things to do, and tourist information, refer to the Salve journey builder website . You can drive from Taranto to Salve in 2 hours. Another option is to take a bus. Expect a daytime high around 29°C in September, and nighttime lows around 22°C. Cap off your sightseeing on the 17th (Thu) early enough to go by car to Lecce. Known as the Florence of the South, Lecce is distinguished for its elaborate Baroque monuments. Kick off your visit on the 18th (Fri): explore the historical opulence of Castello di Corigliano d'Otranto and then enjoy the sand and surf at Baia dei Turchi. Get ready for a full day of sightseeing on the next day: appreciate the extensive heritage of Centro Storico Otranto. 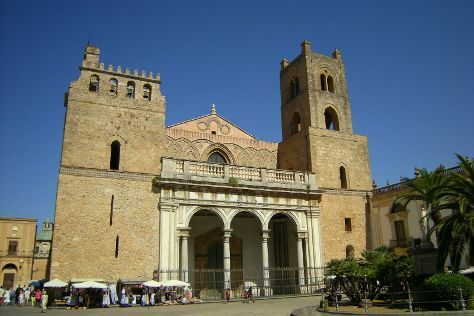 To find ratings, reviews, and more tourist information, you can read our Lecce sightseeing site . Drive from Salve to Lecce in 1.5 hours. Alternatively, you can take a bus. Traveling from Salve in September, plan for slightly colder nights in Lecce, with lows around 19°C. Cap off your sightseeing on the 19th (Sat) early enough to go by car to Monopoli. Monopoli is a town and municipality in Italy, in the province of Bari and region of Apulia. Start off your visit on the 19th (Sat): contemplate in the serene atmosphere at Chiesa San Michele in Frangesto. Keep things going the next day: experience rural life at Masseria Brancati, then delve into the distant past at Scavi D'Egnazia, then enjoy the sand and surf at Lama Monachile, and finally take in the architecture and atmosphere at Basilica Cattedrale Maria Santissima della Madia. Take the guesswork out of planning a Monopoli vacation by using our trip itinerary maker. You can drive from Lecce to Monopoli in 1.5 hours. Alternatively, you can take a train; or take a bus. In September, daily temperatures in Monopoli can reach 29°C, while at night they dip to 17°C. 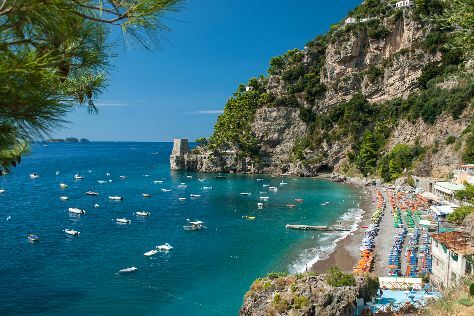 Finish up your sightseeing early on the 21st (Mon) so you can go by car to Amalfi. 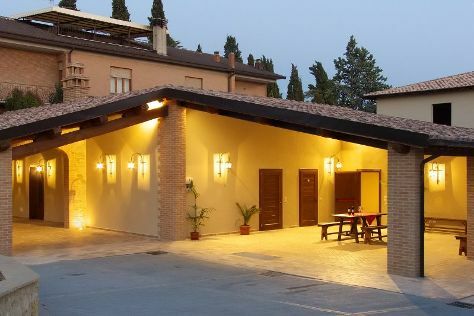 On the 22nd (Tue), enjoy the sand and surf at Fornillo, enjoy the sand and surf at Bagni d'Arienzo, then explore the striking landscape at Cave of Smeraldo, and finally pause for some serene contemplation at Duomo di Sant'Andrea. Get ready for a full day of sightseeing on the next day: admire the sheer force of Valle delle Ferriere. To see maps, more things to do, photos, and more tourist information, read Amalfi online trip planner . Drive from Monopoli to Amalfi in 4 hours. Alternatively, you can take a train; or take a bus. Traveling from Monopoli in September, Amalfi is somewhat warmer at night with lows of 24°C. 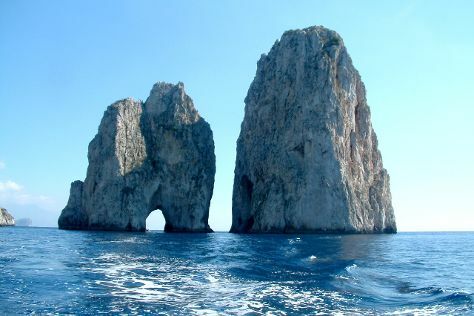 On the 23rd (Wed), wrap the sightseeing up by early afternoon so you can ride a ferry to Capri. The island of Capri encompasses all the magical allure of the Mediterranean--dramatic blue waters, lush mountainous landscape, and picturesque island villages. Kick off your visit on the 23rd (Wed): make a trip to I Faraglioni and then look for gifts at Carthusia. Here are some ideas for day two: trek along Fortini Coastal Walk, don't miss a visit to Villa Lysis, and then kick back and relax at Marina Grande Public Beach. To see more things to do, ratings, traveler tips, and other tourist information, refer to the Capri day trip planning tool . Traveling by ferry from Amalfi to Capri takes an hour. Alternatively, you can do a combination of taxi and ferry; or do a combination of bus and ferry. Expect a daytime high around 31°C in September, and nighttime lows around 23°C. Wrap up your sightseeing on the 25th (Fri) to allow time to ride a ferry to Ravello. Ravello is a town and comune situated above the Amalfi Coast in the province of Salerno, Campania, southern Italy, with approximately 2,500 inhabitants. Start off your visit on the 26th (Sat): admire the striking features of Villa Rufolo, then kick back and relax at Spiaggia di castiglione, then take in nature's colorful creations at Villa Cimbrone Gardens, and finally take in the spiritual surroundings of Duomo di Ravello. On your second day here, stroll through Ravello - Atrani Walk and then take in the pleasant sights at Sentiero degli dei (Path of the Gods). To see reviews, maps, and more tourist information, use the Ravello trip planner. Traveling by ferry from Capri to Ravello takes an hour. Alternatively, you can do a combination of ferry and taxi; or do a combination of ferry and bus. In September, daytime highs in Ravello are 30°C, while nighttime lows are 24°C. Finish your sightseeing early on the 27th (Sun) to allow enough time to travel to Rome. Palatine Hill and St. Peter's Basilica are good opportunities to explore the local culture. Get some historical perspective at Piazza Navona and Catacombe di San Callisto. And it doesn't end there: explore the world behind art at Vatican Museums, steep yourself in history at Roman Forum, admire the striking features of Pantheon, and pause for some serene contemplation at San Pietro in Vincoli. To find photos, maps, more things to do, and tourist information, use the Rome travel itinerary planner. Getting from Ravello to Rome by combination of subway and train takes about 3 hours. Other options: drive; or do a combination of bus and train. Traveling from Ravello in September, plan for slightly colder nights in Rome, with lows around 18°C. Wrap up your sightseeing on the 30th (Wed) to allow time to drive to Assisi. Kick off your visit on the 1st (Thu): take in the spiritual surroundings of Cripta di San Francesco, take in the architecture and atmosphere at Cattedrale di San Rufino, then explore the historical opulence of Rocca Maggiore, then learn about winemaking at Montioni Frantoio e Cantina, and finally don't miss a visit to Piazza del Duomo. Get ready for a full day of sightseeing on the 2nd (Fri): steep yourself in history at Eremo delle Carceri, take in the architecture and atmosphere at Basilica inferiore di San Francesco d'Assisi, then delve into the distant past at Roman Forum and Archaeological Museum, then take in the spiritual surroundings of Basilica of Saint Ubaldo, and finally see the interesting displays at Palazzo dei Consoli and Museo Civico. Plan trip to Assisi with our itinerary maker to find out where to go and what to do. Traveling by car from Rome to Assisi takes 2.5 hours. Alternatively, you can take a train; or take a bus. In September in Assisi, expect temperatures between 30°C during the day and 16°C at night. Finish up your sightseeing early on the 3rd (Sat) so you can travel to Isola Del Giglio. Start off your visit on the 3rd (Sat): take in the dramatic natural features at Faraglione dell'Isola del Giglio and then tour the pleasant surroundings at Bagno Giglio Blu. Get ready for a full day of sightseeing on the next day: get a new perspective on things with Boat Tours & Water Sports and then enjoy the sand and surf at Bagno Amaranto. To see photos, maps, other places to visit, and more tourist information, read Isola Del Giglio holiday planning website . Traveling by combination of car and ferry from Assisi to Isola Del Giglio takes 4 hours. Alternatively, you can do a combination of train and ferry; or do a combination of bus, train, and ferry. In October in Isola Del Giglio, expect temperatures between 26°C during the day and 15°C at night. Finish up your sightseeing early on the 4th (Sun) so you can travel to Florence. Start off your visit on the 5th (Mon): admire the landmark architecture of Loggia dei Lanzi, get to know the fascinating history of Piazza del Duomo, then pause for some serene contemplation at Cathedral of Santa Maria del Fiore, then appreciate the extensive heritage of Centro Storico, and finally contemplate in the serene atmosphere at The Baptistery of St. John. 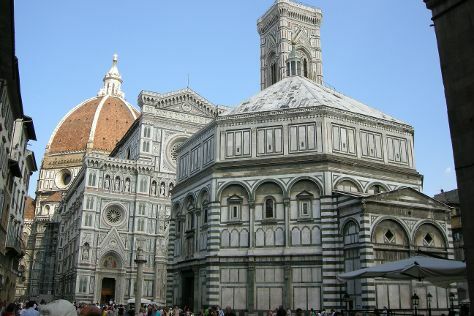 Here are some ideas for day two: see the interesting displays at Academy Of Florence Art Gallery, admire the landmark architecture of Basilica San Miniato al Monte, then take some stellar pictures from Piazzale Michelangelo, then explore the world behind art at Uffizi Galleries, and finally snap pictures at Ponte Vecchio. For other places to visit, maps, more things to do, and other tourist information, refer to the Florence road trip site . Getting from Isola Del Giglio to Florence by combination of ferry and car takes about 3.5 hours. Other options: do a combination of ferry and train; or do a combination of ferry and bus. In October, daily temperatures in Florence can reach 25°C, while at night they dip to 14°C. Cap off your sightseeing on the 6th (Tue) early enough to catch the train to Venice. Visit Peggy Guggenheim Collection and St. Mark's Square for their historical value. Eschew the tourist crowds and head to Scrovegni Chapel and Basilica Santa Maria Gloriosa dei Frari. And it doesn't end there: explore the activities along Canal Grande, take a stroll through Cannaregio, take in the views from Ponte di Rialto, and contemplate the long history of Ponte dei Sospiri. For traveler tips, ratings, where to stay, and more tourist information, refer to the Venice online travel planner . Traveling by train from Florence to Venice takes 2.5 hours. Alternatively, you can drive; or take a bus. Traveling from Florence in October, you will find days in Venice are little chillier (22°C), and nights are about the same (12°C). Wrap up your sightseeing by early afternoon on the 12th (Mon) to allow time for the train ride to Milan. Start off your visit on the 12th (Mon): pause for some serene contemplation at Chiesa di Sant'Andrea Apostolo. Here are some ideas for day two: take a stroll through Brera District and then tour the pleasant surroundings at Parco Faunistico le Cornelle. For more things to do, ratings, photos, and tourist information, read Milan road trip planning app . You can take a train from Venice to Milan in 2.5 hours. Other options are to drive; or do a combination of train and flight. In October, daytime highs in Milan are 21°C, while nighttime lows are 13°C. Finish your sightseeing early on the 15th (Thu) so you can drive to Tremezzina. Kick off your visit on the 15th (Thu): explore the striking landscape of Val Belviso. On your second day here, explore the historical opulence of Castello di Vezio, expand your understanding of the military at Forte Montecchio Nord, admire the striking features of Chiesa Santa Maria del Tiglio, then browse the exhibits of Villa Carlotta, and finally admire the striking features of Villa del Balbianello. To find more things to do, other places to visit, and more tourist information, refer to the Tremezzina trip itinerary maker tool . Traveling by car from Milan to Tremezzina takes 1.5 hours. Alternatively, you can do a combination of train and ferry; or do a combination of train and bus. In October, daytime highs in Tremezzina are 20°C, while nighttime lows are 11°C. Wrap up your sightseeing by early afternoon on the 17th (Sat) to allow time for travel to Montichiari. Montichiari is a town and comune in the province of Brescia (Italian: Provincia di Brescia), in Lombardy (Italian: Lombardia). Kick off your visit on the 17th (Sat): take in the architecture and atmosphere at Chiesa del Suffragio and then step into the grandiose world of Castello Bonoris. Keep things going the next day: enjoy breathtaking views from Cathedral of Cremona, then appreciate the extensive heritage of Centro Storico, and then pause for some serene contemplation at Santa Maria Assunta Cathedral. To find ratings, where to stay, photos, and tourist information, read our Montichiari holiday planner. Traveling by car from Tremezzina to Montichiari takes 2.5 hours. In October in Montichiari, expect temperatures between 21°C during the day and 13°C at night. You'll have a few hours on the 20th (Tue) to wrap things up before traveling home.